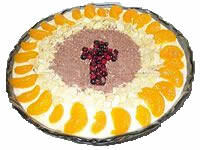 At Thrale family gatherings you can be sure of one thing, David is asked to make his popular trifle. I'd like to claim the credit for this great recipe, but I really learnt it from my parents - Ken and Shirley - who made it for their occasional dinner parties. The secret is that it contains no jelly. Makes about 10 portions.